Even if it has a comfortable majority in Parliament, no one should envy the current Communist rulers of Nepal. Prime Minister K P Oli, for all his bluster and swagger, confronts a mountain of mounting troubles. Some of them, to be sure, are inherited from failed previous regimes. Oli was partly right in blaming his predecessors for the state of the streets of the capital this monsoon which look like they are pocked with calderas. But it is also true that he was one of his own predecessors, and the mayors belonging to his party have done zilch to fix the roads in the year since they assumed office. The dreadful state of Kathmandu’s thoroughfares today are emblematic of the state of the nation. However, there have been signs the PM is beginning to see the writing on the wall. His teams managed to convince to call off the hunger strikes of two activists in the nick of time before the tragedy of their deaths triggered a larger national emergency. Gangamaya Adhikari put off her fast after the government agreed to demands that her son’s murderers be brought to trial. This set a precedent for all other transitional justice cases for families of war victims still awaiting closure. After bungling its response to Govinda KC’s hunger strike by its initial unwillingness to address his demand for reforms in medical education, the government began negotiating in earnest only after the fast was about to enter its fourth week, and the doctor was in danger of suffering multiple organ failure. The question arises why, if such a bold intervention by the Prime Minister was possible, did the government take the risk of waiting so long to even negotiate? Why did the police dupe KC? The brinkmanship cost the NCP, and Oli personally, much public support. It convinced many (even those who voted Communist) that the leaders had lost their way. A government that said it was here for the next five years squandered most of its trust in just five months. There have been many other issues which the government has mishandled, botched, or been recklessly cavalier about. There has been an all-around squeeze on open society. Few disagreed that the activities of outside agencies in relief and development needed better monitoring, but the government’s draft code of conduct for INGOs and donors appeared to have been designed less to regulate, and more for control. Widespread criticism of the move seems to have rattled officials. A minister told representatives of the donor and diplomatic community that the guidelines were just a draft, and merely suggestions. But some other ministers have lashed out at critics in xenophobic tones, calling them ‘dollar farmers’. The Prime Minister himself assured members of a party-affiliated media club of handsome rewards if they wrote in support of the government, and his Information Minister this week scolded editors who dared express solidarity with Govinda KC. Fears of a drift towards authoritarianism, especially, appears to have hit a raw nerve. Ministers who should be reassuring the public, have gone around banning programs critical of them, or issuing open threats, duly amplified by the Facebook faithful. The lesson we should learn from the doublespeak in totalitarian states is to take what officials assert most emphatically with a pinch of salt because that is what is farthest from the truth. 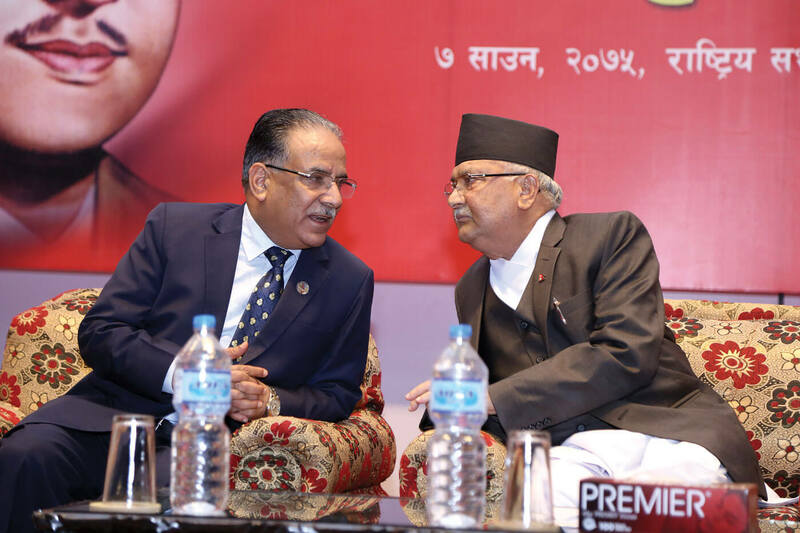 The Nepali people had collectively thought that by giving the NCP such a thumping majority, that would end the incessant squabbling and the instability that had become the norm in the coalition governments in the past decades. The people trusted that the NCP would use its majority wisely to address some of the country’s structural problems and deliver better living standards. However, the government has been kept so busy firefighting from day-to-day (much of it caused by its own actions. it must be said) that it has had little time to pay attention to the other looming crises. The government needs all the allies it can get in confronting the challenges ahead: delivering affordable quality health and education, fixing crumbling infrastructure, curbing inflation, extortion and corruption, and the biggest hurdle of all: finding jobs for the 700,000 young Nepalis who enter the job market every year. The federal government is dilly-dallying in providing the constitutionally stipulated legal framework for provincial and local governments, which has brought the centre in direct confrontation with the periphery. The blame for some of the outlandish decisions by provincial governments, like the new tax on bicycles announced by one of them, is therefore being heaped on Kathmandu. The few correct decisions taken in the past weeks (Gangamaya, Govinda KC) happened because Prime Minister Oli responded to public opinion. That should serve as an important template for the future. ‘This past week of tyre-burning proved, if proof is still needed, just how volatile and unstable the political situation still is. The spark of the vice-president’s ill-advised decision to take his oath in the official language of a neighbouring country lit the brush fire. The lingering political deadlock fanned it.